Scoop is a ride-sharing app that aims to improve traffic by matching drivers and riders on a per day on-demand need. Each day at morning and afternoon commutes, the system send a text message of others along your route. Most times, it's somebody who works nearby and lives near your home. Additionally, it works by compensating the driver for successful carpools. On the surface, the details made sense for me as a driver, so I figured I'd sign up and give it a shot. Scoop's interface is completely mobile, available for Android and iOS. There is a website, but it merely links you to their mobile app. There is not a login dialog on the website, so any configurations need to happen on the app. Once registered and all the details, Scoop begins sending text messages to you. Now I've decided that carpooling is too much for me and not worth the extra time and hassle. As much as I think it would be great to reduce traffic with carpooling, it's just too much work to have to schedule on a daily carpools. I've already uninstalled the app and unsubscribed from all emails, but for some reason, I keep receiving text messages? My assumption is that closing my Scoop account would deactivate all message, but that doesn't seem to be the case. 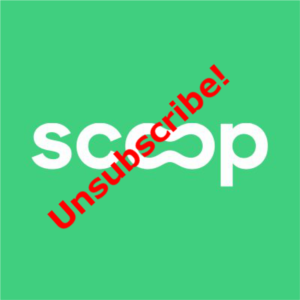 How to Unsubscribe from Scoop Text Messages? To unsubscribe to text messages, all you need to do is reply back to your text message with "unsubscribe". This will discontinue all text messages. The concept for Scoop was great, but in practice just didn't make a whole lot of sense for me to use in the long term. I did like the fact that I would have been compensated, but in the same way, finding a coworker to carpool and splitting the gas would have achieved the same thing. Additionally, because my commute wasn't very long, the additional time pickup and drop off would very likely double my commute, thereby negating any benefit from carpooling.